Several entries, a few exits and lots of twists and turns are what is making up Star One’s Miley Jab Hum Tum. Recently the show had some new faces entering the show as the show took a leap for Season 2. Now the show is gearing up for some action between the recently entered characters of Rohan (Nikhil Chaddha) and Nirbhay (Meer Ali). The two would get involved into a boxing competition to earn a place in Excel College. The show will witness the entry of Ria (Kruti) who plays Rohan’s sister. Rohan has already distributed pamphlets and put up a notice to stay away from her as she is always in need of attention. This infuriates her and this is the reason why she does not want admission in Excel. However Rohan wants his sister to be around him so that he can take care of her. However it so happens that there is only one seat for which Nirbhay and Ria have to compete. After the initial competition round both stand equal chances of getting through to the college. 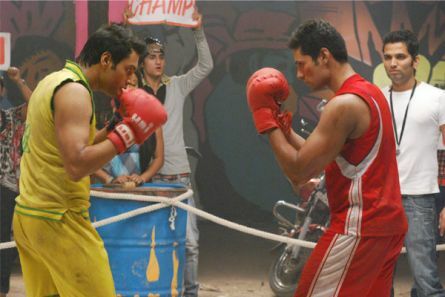 That is when Rohan suggests a boxing competition which Nirbhay accepts. When asked about who would win the match, Chaddha replied, “I won’t reveal that for sure.” The episode will be telecast sometime this week.